This chapter explains how to create menus and menu bars, add menu items, group the menus into categories, create submenus, and set context menus. 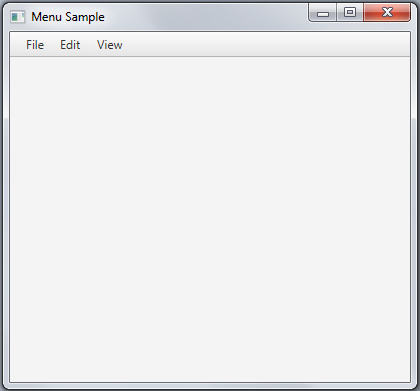 You can use the following classes of the JavaFX API to build menus in your JavaFX application. Figure 24-1 shows a screen capture of an application with a typical menu bar. Description of "Figure 24-1 Application with a Menu Bar and Three Menu Categories"
A menu is a list of actionable items that can be displayed upon a user's request. When a menu is visible, users can select one menu item at time. After a user clicks an item, the menu returns to the hidden mode. By using menus, you can save space in your application user interface (UI) by placing in menus the functionality that does not always need to be visible. To separate menu items within one category, use the SeparatorMenuItem class. The menus organized by categories in a menu bar are typically located at the top of the window, leaving the rest of the scene for crucial UI elements. If, for some reasons, you cannot allot any visual part of your UI for a menu bar, you can use context menus that the user opens with a mouse click. Although a menu bar can be placed elsewhere in the user interface, typically it is located at the top of the UI and it contains one or more menus. The menu bar automatically resizes to fit the width of the application window. By default, each menu added to the menu bar is represented by a button with the text value. Consider an application that renders reference information about plants such as their name, binomial name, picture, and a brief description. You can create three menu categories: File, Edit, and View, and populate them with the menu items. Example 24-1 shows the source code of such an application with the menu bar added. "The hawthorn is a large genus of shrubs and trees in the rose "
+ "family, Rosaceae, native to temperate regions of the Northern "
+ "Hemisphere in Europe, Asia and North America. " 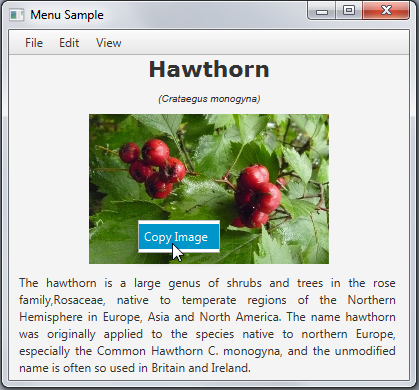 + "The name hawthorn was "
"The ivy is a flowering plant in the grape family (Vitaceae) native to"
Unlike other UI Controls, the Menu class and other extensions of the MenuItem class do not extend the Node class. They cannot be added directly to the application scene and remain invisible until added to the menu bar through the getMenus method. Description of "Figure 24-2 Menu Bar is Added to the Application"
You can navigate through the menus by using the arrow keys of the keyboard. However, when you select a menu, no action is performed, because the behavior for the menus is not defined yet. 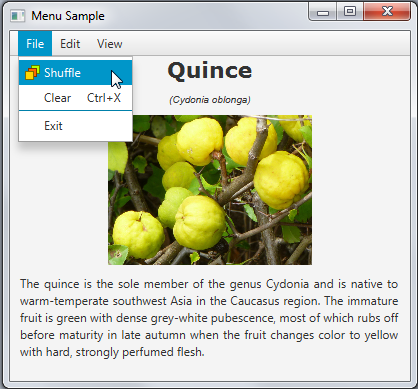 Bold lines in Example 24-2 create a Shuffle menu by using the MenuItem class and add graphical components to the application scene. The MenuItem class enables creating an actionable item with text and graphics. The action performed on a user click is defined by the setOnAction method, similar to the Button class. +"domestica in the rose family (Rosaceae). It is one of the most "
+"widely cultivated tree fruits, and the most widely known of "
+"the many members of genus Malus that are used by humans. " +"The tree originated in Western Asia, where its wild ancestor, "
"The ivy is a flowering plant in the grape family (Vitaceae) native"
+" to eastern Asia in Japan, Korea, and northern and eastern China." +" It is a deciduous woody vine growing to 30 m tall or more given "
+"suitable support,  attaching itself by means of numerous small "
"The quince is the sole member of the genus Cydonia and is native"
+" to warm-temperate southwest Asia in the Caucasus region. The "
+"immature fruit is green with dense grey-white pubescence, most "
+"of which rubs off before maturity in late autumn when the fruit "
When a user selects the Shuffle menu item, the shuffle method called within setOnAction specifies the title, the binomial name, a picture of the plant, and its description by calculating the index of the elements in the corresponding arrays. The Clear menu item is used to erase the application scene. You can implement this by making the VBox container with the GUI elements invisible as shown in Example 24-3. Implementation of the MenuItem class enables developers to set a menu accelerator, a key combination that performs the same action as the menu item. With the Clear menu, users can either select the action from the File menu category or press Control Key and X key simultaneously. The Exit menu closes the application window. Set System.exit(0) as an action for this menu item as shown in Example 24-4. Use the getItems method shown in Example 24-5 to add the newly created menu items to the File menu. You can create a separator menu item and add it within the getItems method to visually detach the Exit menu item. Add Example 24-2, Example 24-3, Example 24-4, and Example 24-5 to the Menu Sample application, and then compile and run it. 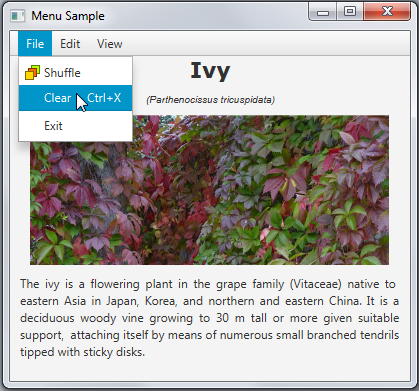 Select the Shuffle menu item to load reference information about different plants. Then clear the scene (Clear), and close the application (Exit). Figure 24-3 shows selection of the Clear menu item. 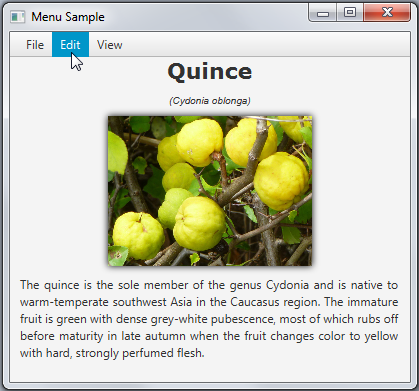 Description of "Figure 24-3 File Menu with Three Menu Items"
With the View menu, you can hide and show elements of reference information. Implement the createMenuItem method and call it within the start method to create four CheckMenuItem objects. Then add newly created check menu items to the View menu to toggle visibility of the title, binomial name, picture of the plant, and its description. Example 24-6 shows two code fragments that implement these tasks. The CheckMenuItem class is an extension of the MenuItem class. It can be toggled between selected and deselected states. When selected, a check menu item shows a check mark. Example 24-6 creates four CheckMenuItem objects and processes the changing of their selectedProperty property. When, for example, a user deselects the picView item, the setVisible method receives the false value, the picture of the plant becomes invisible. When you add this code fragment to the application, compile, and run the application, you can experiment with selecting and deselecting the menu items. Figure 24-4 shows the application in the moment when the title and picture of the plant are shown, but its binomial name and description are hidden. 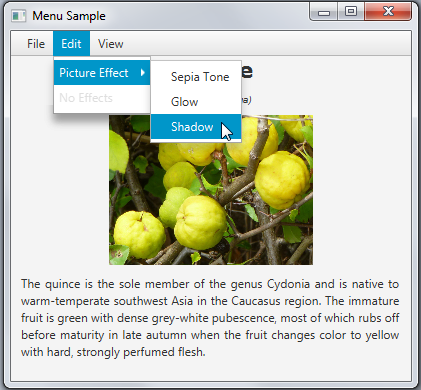 Description of "Figure 24-4 Using Check Menu Items"
For the Edit menu, define two menu items: Picture Effect and No Effects. The Picture Effect menu item is designed as a submenu with three items to set one of the three available visual effects. The No Effects menu item removes the selected effect and restores the initial state of the image. Use the RadioMenuItem class to create the items of the submenu. Add the radio menu buttons to a toggle group to make the selection mutually exclusive. Example 24-7 implements these tasks. The setUserData method defines a visual effect for a particular radio menu item. When one of the items in the toggle group is selected, the corresponding effect is applied to the picture. When the No Effects menu item is selected, the setEffect method specifies the null value and no effects are applied to the picture. Figure 24-5 captures a moment when a user is selecting a Shadow menu item. Description of "Figure 24-5 Submenu with Three Radio Menu Items"
When the DropShadow effect is applied to the picture, it looks as shown in Figure 24-6. 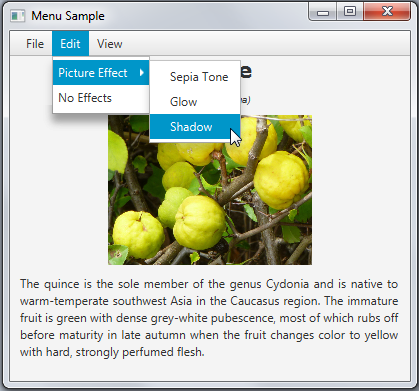 Description of "Figure 24-6 Picture of Quince with a DropShadow Effect Applied"
You can use the setDisable method of the MenuItem class to disable the No Effects menu when none of the effects are selected in the Picture Effect submenu. Modify Example 24-7 as shown in Example 24-8. When none of the RadioMenuItem options are selected, the No Effect menu item is disabled as shown in Figure 24-7. When a user selects one of the visual effects, the No Effects menu item is enabled. Description of "Figure 24-7 Effect Menu Item Is Disabled"
When you cannot allocate any space of your user interface for a required functionality, you can use a context menu. A context menu is a pop-up window that appears in response to a mouse click. A context menu can contain one or more menu items. 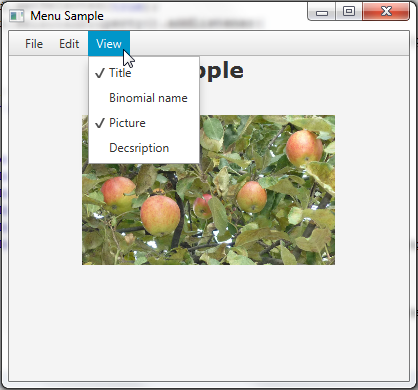 In the Menu Sample application, set a context menu for the picture of the plant, so that users can copy the image. Use the ContextMenu class to define the context menu as shown in Example 24-9. When a user right clicks the ImageView object, the show method is called for the context menu to enable its showing. The setOnAction method defined for the Copy Image item of the context menu creates a Clipboard object and adds the image as its content. Figure 24-8 captures a moment when a user is selecting the Copy Image context menu item. Description of "Figure 24-8 Using the Context Menu"
You can try to copy the image and paste it into in a graphical editor. For further enhancements, you can add more menu items to the context menu and specify different actions. You can also create a custom menu by using the CustomMenuItem class. With this class you can embed an arbitrary node within a menu and specify, for example, a button or a slider as a menu item.